There are many times when you want to stop, or suppress remote printing for an employee. The most common reason is that this employee is a bartender and doesn't want remote drink tickets (kitchen chit) printing when they're the one entering it. They already know the order and don't want to waste paper. This is known as "Suppressing Departments". 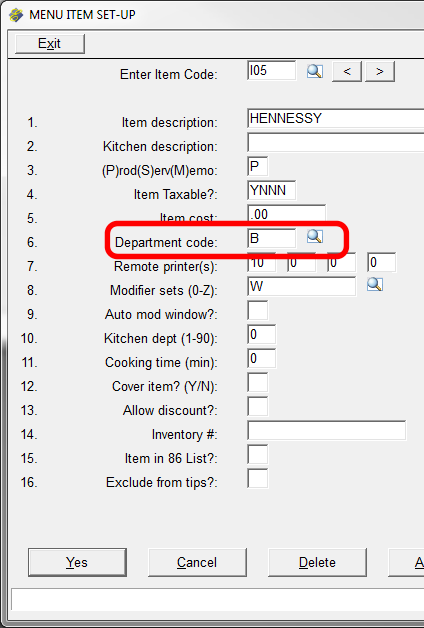 A department may only be suppressed if it is a single character department code, like B or 5. The first step is to identify the departments to suppress. You'll find these in the POS Menu Item Setup in the Administrator Menu. 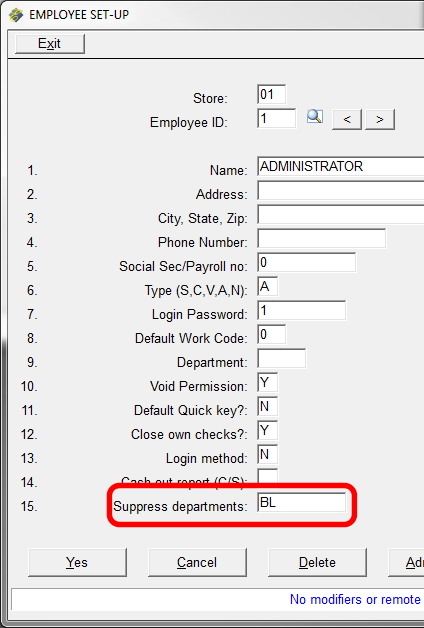 The second step is to edit the Employee Record and add the departments you want to suppress. This is done in Employee Records in the Administrator Menu. Enter the departments one after the other, with no spaces, commas, etc. In the picture, below, categories B and L will be suppressed when this employee rings up these items.